Heikki Kovalainen followed in Fernando Alonso's footsteps from his F1 debut in Renault, replacing the Spaniard, to taking up his spot in McLaren for 2008. Heikki moved to the Lotus team that became Caterham for three seasons, before finding himself without a race seat in 2013 - although they retained his services as test/development driver. He deputised for Räikkönen for two races in 2013, before leaving the sport altogether. After several years in junior categories, Finnish racer Kovalainen started to get results. He finished third in the British Formula Three championship in 2002, and took home the World Series by Nissan title two years later. For 2006, he drove for the Arden International team in the GP2 series, losing out on the championship to Nico Rosberg, but picking up many trophies along the way. Formula One was the next step. For the first three years of his career, Heikki Kovalainen was the driver that picked up where Fernando Alonso left off. He made his F1 debut at the Renault team, when the Spaniard had left to try his luck with McLaren. When that didn’t work out, and Alonso returned to Renault, it was Kovalainen who stepped up to McLaren. He remained with the Woking squad for two years, before finding himself without a race seat when McLaren brought in Jenson Button. It was unlikely that Kovalainen could follow Alonso to Ferrari, and so the Finn found himself with a new team, then known as Lotus Racing. Heikki has played a big part in keeping the team best of the three new outfits that joined in 2010, and he’s been the key to their success - if you can count success as finishing 10th three years in a row. Kovalainen was ousted from the Caterham team at the end of 2012, but they brought him back as a reserve/development driver after just four races of the 2013 season. For the final two rounds of 2013, Kovalainen moved to the Lotus Renault squad to race in place of an injured Kimi Räikkönen. At the end of the year, he was left without a race seat at either team. For the 2014 season, Heikki joined the BMW team as a test driver for their DTM efforts. After that, he joined the Super GT series, driving for Lexus. Heikki Kovalainen has come in for his second stop, harder tyres going on that Lotus car. Valtteri Bottas passes Vergne, but then the Toro Rosso gets the place back and Heikki Kovalainen also snatches the opportunity to move through as well. Heikki Kovalainen has taken his first pit stop of the afternoon, rejoining back out in 20th. Somehow, Max Chilton is still behind him. Heikki Kovalainen has managed to overtake, squeezing past the Williams of Pastor Maldonado for 15th place. Nico Rosberg passes Heikki Kovalainen, just as the Lotus driver comes in to the pits. Talking of which, Heikki Kovalainen comes in for the first scheduled pit stop of the day. 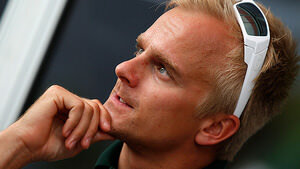 Interview with Heikki Kovalainen: "I'm not nervous, I've been relaxed all weekend. When you don't know what to expect, it's difficult to set specific targets for yourself. The car felt good on the lap to the grid, it's been feeling good all weekend. Hopefully we'll have a good weekend. "I believe I can handle [the start] but in a couple of hours time, when I talk to you again, we'll know more. I've been satisfied so far... the car's been well balanced straight away. On Friday, we were able to work on the set up rather than getting familiar with it too much. This hotter weather hopefully works better for us. Today could potentially be a good day." Let us not forget that Kimi Räikkönen has made a swift exit from the Lotus team, and is currently recovering from a successful back surgery. In his place, Heikki Kovalainen has made the switch from Caterham for the final two rounds of the year. And, of course, Heikki Kovalainen got into the top ten on his comeback qualifying. He was about half a second off his teammate, but that's still a great showing. However, the attention is all on Heikki Kovalainen, who makes his triumphant F1 return in place of Kimi Räikkönen, who is currently recovering from back surgery.